Tori received her Physical Therapist Assistant degree from Wallace State Community College. She has been practicing for two years and has been with Encore Rehabilitation for one year. Tori treats patients at the Encore Rehabilitation Clinics in Haleyville and Russellville, Alabama. We appreciate all you do, Tori! Happy National Physical Therapy Month! 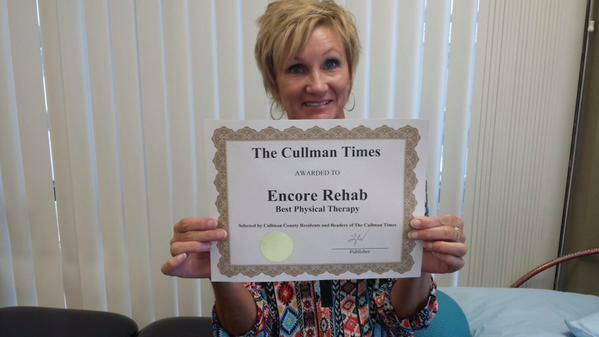 One of our PTA’S, Sharon Edens, holding our @TheCullmanTimes best therapy award! Thanks city of Cullman — We are proud to be your physical therapy provider!